Today’s model building codes prohibit the use of traditional wired glass in hazardous locations like doors, sidelites, and any location that requires safety. Wired glass is not safety glass. The wires actually weaken the glass and wired glass panels can break with as little as 50 ft. lbs. of force, or the force exerted by a small child running into this glazing. 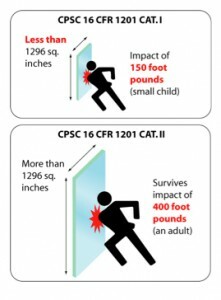 In 1977, traditional wired glass was given an exemption from meeting the CPSC impact safety standard when used in doors, sidelites and other potentially hazardous locations because wired glass manufacturers claimed that they did not have the technology to meet such critical standards. Twenty-five years later, they still claimed that they could not meet these safety standards. This all changed when safety wired glass products, such as SaftiFirst’s filmed Superlite I-W, were introduced. The 2003 IBC removed the exemption for traditional wired glass in educational and athletic facilities and set forth that the federal safety glazing standards applied in those buildings. In the 2004 IBC Supplement and the 2006 IBC code, restrictions were taken one step further. The result was that traditional wired glass is no longer exempt from meeting safety standards when used in any potentially hazardous location. This applies to all new construction and in all types of occupancies (see Sec. 2406.1.1 in the 2003 and 2006 IBC). New safety wired glass is economical and meets all the fire protective glazing and safety standards, making it the best value in fire rated glass.